Axon guidance relies on the reception and integration of molecular cues from the environment by growth cones, and defective pathfinding results in misplaced projection patterns in the mature nervous system. A new paper in Development investigates this process in the Drosophila neuromucular system, as well as the consequences of axonal miswiring to locomotion. We caught up with lead author Jaqueline Kinold and her supervisor Hermann Aberle, Professor in the Department of Functional Cell Morphology at Heinrich Heine University, Düsseldorf. Hermann, can you give us your scientific biography and the questions your lab is trying to answer? HA In retrospect, I find it quite interesting that my work was all the time somehow associated with cell adhesion and cellular junctions. 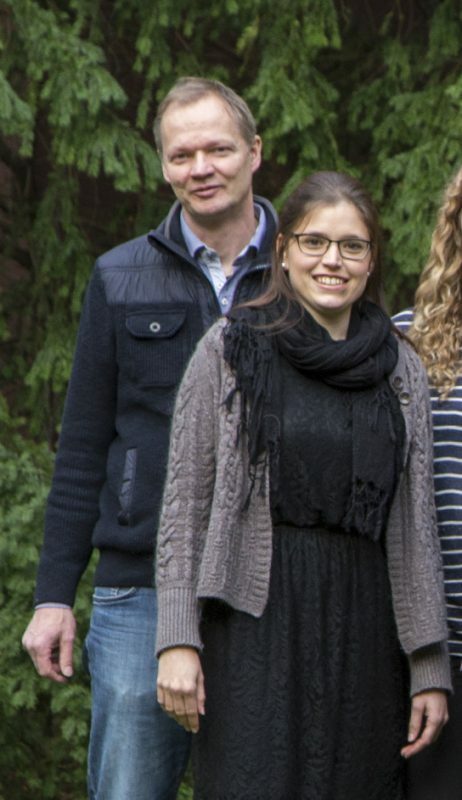 I started off as a PhD student in Rolf Kemler‘s lab in Freiburg, working on vertebrate Cadherin-Catenin complexes, which connect neighbouring epithelial cells at adherens junctions. As a postdoctoral fellow, I switched topics and changed to Drosophila neuromuscular junctions (NMJs) in Corey Goodman‘s lab at UC Berkeley, where I was involved in a large-scale mutagenesis screen searching for genes that affected the morphology of these terminals. After cloning and functional characterization of the wishful thinking gene, I moved to Christiane Nüsslein-Volhard‘s lab at the MPI for Developmental Biology in Tübingen. There, we cloned several other genes that came out of the screen, including tolloid-related, mical, ankyrin-2 and neuroligin-1. During this time, and inspired by work of Darren Gilmour, we also developed tools and techniques to image migrating motor axons in living Drosophila embryos. Receiving a grant from the German Research Foundation and a generous invitation to join Christian Klämbt‘s department, we moved to the University of Münster, where we not only had fantastic imaging opportunities but also focussed more and more on the function of the axon guidance molecule sidestep (side), which also came out of the screen. In 2010, I received a call from the Heinrich Heine University in Düsseldorf, where we developed the idea to search for behavioural consequences of wiring defects. Jaqueline, how did you come to join the lab, and what drives your research? JK I studied biology at the University of Kassel and did my diploma thesis on the topic of spermatogenesis in Drosophila under the supervision of Mireille Schäfer. Afterwards, I wanted to continue my research with Drosophila, but I could imagine a change of topic and laboratory for my PhD very well. Hermann’s job advertisement and also his project description during my interview fascinated me very much. On the one hand, the correct wiring of the muscles is a multifaceted process in which many different components interlock and, on the other hand, the different methods and starting points spoke in favour of joining Hermann’s laboratory. Control and side mutant larvae expressing the postsynaptic marker ShGFP and dsRed in motor acons and salivary glands. From Figure 1 in the paper. When did your lab first get interested in the link between neuronal wiring and locomotion in flies? HA Since the phenotype of side mutants is really strong, I was once asked after a talk if this has any consequences for viability or eclosion. This question stuck in my mind and I started to realize that most papers in the field dealt with the guidance process itself, in embryos, and hardly anybody was exploring postembryonic stages, when the neuromuscular system is actually functional and constantly contracting. Together with the Drosophila community moving more and more into circuit analysis and behavioural studies, I asked myself which behaviour could be affected by our mutations. It took a while until I realized that locomotion and movements are the underlying basis for most, if not all, behaviours. However, it took a while until we had all the necessary technical equipment. In fact, everything truly started as the high-speed video camera arrived. 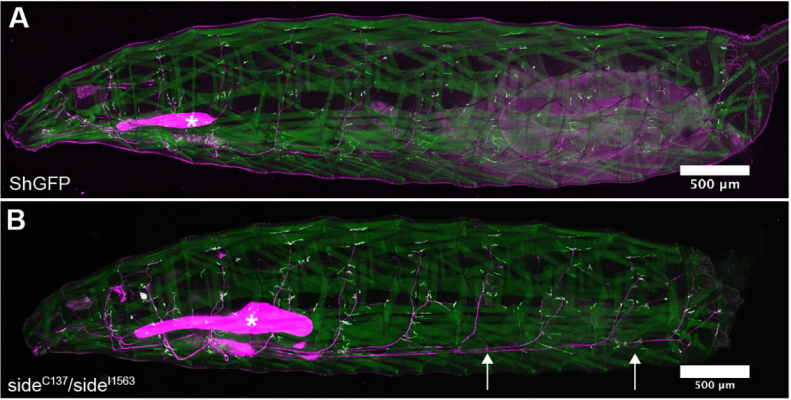 HA We examined the final innervation pattern on all muscles in side mutant third instar larvae. From this survey, we derived three major conclusions. First, innervation defects were permanent, i.e. even if potential rescue mechanisms exist, they failed to restore NMJs at non-innervated muscles. Second, loss of side affected all peripheral motor pathways and thus all body wall regions. Third, innervation errors were non-stereotypical and appeared in each hemisegment differentially. Since Side functions as a substrate-bound attractant, ventral bypass phenotypes or lack of NMJs at distal-most muscles, could be explained by insufficient attraction, which either inhibits defasciculation or slows axonal growth, respectively. JK Also, overexpression of Side attracted motor axons at the wrong time to the wrong place, resulted in innervation defects. This was particularly evident when we expressed Side in muscle precursors. Attraction was that strong that individual axons travelling in the ISN were stretched into opposite directions leading to split pathways and complete lack of NMJs on dorsal-most muscles. This caused also amazing locomotion phenotypes. During crawling, larvae detached from the substrate and excessively lifted their head and tail segments into the air, despite lack of dorsal innervation. Nobody was expecting such a phenotype. Crawling seems to be much more complex than anticipated. A dorsal view of third instar larvae showing some of the variability in the side phenotype, from Figure 2 in the paper. side mutants show considerably variable phenotypes, even in adjacent hemisegments. 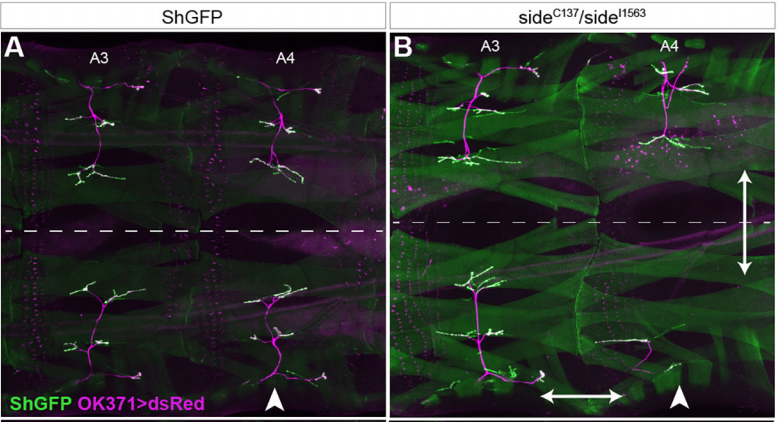 What do you think this tells us about how axon guidance works in flies? HA At the beginning of the screen, in Corey Goodman’s lab, we discussed a lot what kind of phenotypes we might possibly find. One such idea was that we might find genes that affect only a single NMJ on a specific muscle fibre, because we imagined a key-and-lock mechanism for wiring 30 muscle fibres, where unique ligands on motor axons connect to cognate receptors on muscles. Inactivating such a receptor by point mutations should in theory prevent the formation of the associated NMJ. Unfortunately, we did not find this phenotypic class, nor did anybody else. We therefore think that motor axon guidance in Drosophila is not hard-wired by high-affinity ligand-receptor complexes but rather functions via co-operative actions of several guidance molecules. Newer finding in Pablo Labrador‘s laboratory also push this older idea originally developed in the Keshishian and Goodman labs. Guidance decisions therefore seem to be made at several points and sum up along the entire path. If several decisions go wrong in a row, phenotypes become noticeable. Do the locomotion defects you found in larvae have anything to tell us about movement disorders in mammals? HA Oh yes, I think this is one of the interesting parts of our story. Similar to Drosophila, there are only a few mammalian studies that correlate axon guidance errors with muscle innervation patterns. But these studies made several interesting observations. First, in mice, if a motor nerve branch fails to develop or is severely stalled, entire muscle fields are not innervated after birth causing muscle atrophy. In limbs, this can lead to paralysis and aberrant locomotion patterns. Second, the phenotypes are not necessarily symmetrical and occasionally affect only one side of the body, i.e. very similar to the unilateral defects observed in side mutants. Third, feet and ankles of affected limbs are occasionally twisted inward in newborn mice, a deformity highly reminiscent to congenital clubfoot in humans. The aetiology of clubfoot is still not fully understood, but since it frequently develops unilaterally, one speculative possibility is that it could develop due to innervation defects. JK There was not one key moment that has stuck with me, but several small highlights, especially at the laser-scanning microscope. I am over and over again enthusiastic about how “beautiful” the axonal pattern in the embryo or larva is. Further, I had such special moments when larvae showed particularly strong or unusual phenotypes during crawling, which looks sometimes quite funny. Drosophila larva overexpressing Side in muscles and showing an extreme crawling phenotype. JK Yes, there were some of these frustrating moments, especially handling living larvae for videography. During my research, I have realized that Drosophila larvae have sometimes their own mind, as they decided not to crawl at all or not to crawl in a straight line for the high-speed videography, but rather to crawl away from the nicely prepared agar block. JK Since this paper is only a partial project of my PhD thesis, I plan for the next months to press ahead with another project for publication – hopefully we can submit the manuscript successfully at the end of this year. And where will this work take the Aberle lab? HA One direction we are heading is how locomotion in animals with hydrostatic skeletons works after all. Crawling behaviour is much more sophisticated and fine-tuned than it appears at first glance. We would like to understand how specific muscle groups contribute to particular movements and how this is antagonized by the liquid-filled body cavity. Which muscle groups, for example, induce rolling escape behaviours during attacks of predatory wasps or coordinate jumping in some dipteran larvae. Ultimately we would like to find mutations or conditions which activate or inactivate particular movements, in order to better understand the underlying circuitry and machinery. Another line of research will certainly be the functional analysis of the entire Sidestep family. There are 7 Side paralogs in the Drosophila genome and virtually nothing is currently known about their functions. 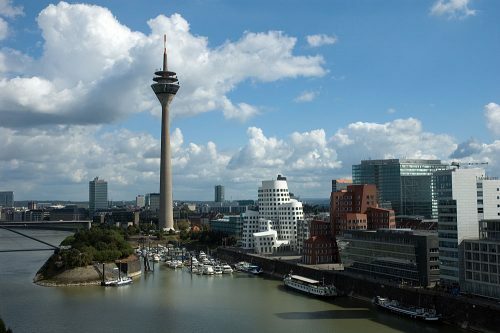 The Düsseldorf skyline. Image credit: Ingo Valentin, from Wikipedia. Finally, let’s move outside the lab – what do you like to do in your spare time in Düsseldorf? JK As I am a very water-loving person, I like to spend my spare time along the Rhine river – whether for a walk or to make myself comfortable on a blanket on its shores and let my soul dangle watching the ships passing by. I also like to take advantage of the city’s concert events, as two of my favourite bands, “Die Toten Hosen” and “Broilers”, come from Düsseldorf and regularly give concerts in the city. Furthermore, the whole laboratory and I like to celebrate the Düsseldorf Carnival, which takes place every spring. HA Düsseldorf has a quite lively art scene, and since I enjoyed landscape photography very much during my undergraduate years, I am particularly drawn to the “Düsseldorf School of Photography”, founded by Bernd and Hilla Becher. Whenever there are exhibitions by Andreas Gursky, Axel Hütte, Thomas Ruff, to name a few, I try to not miss the vernissage. I also love to shop for coffee-table books in local stores. This is #49 in our interview series. Browse the archive here.